The Radley Lakes, that well known local wildlife biodiversity hotspot, was the location of a recent find of an extremely rare giant sawfly. Local resident and naturalist Jo Cartmell found the recently-deceased insect on the ground near Bullfield Lake on 19th August. At first she thought she had found a dead hornet, a species known to inhabit the area. However on closer inspection, she saw it was clearly something quite different and sought more expert opinion. However local entomologists were unable to identify it, and the specimen eventually ended up in the hands of Darren Mann, Curator of the Oxford Natural History Museum Entomological Collection, who positively identified it as Cimbex connatus(Schrank 1776). This, it turned out, was quite an exciting find. by Jo Cartmell on 19th August 2009. Up until 1997, Cimbex connatus was virtually extinct in Britain not having been recorded for over 90 years, the last record before that being in 1904. In the 19th century, it appears to have been quite widespread in southern England , having been found in Suffolk , Kent , Surrey , Sussex , Devon and Cornwall . In July 1997, the insect turned up again near Salisbury in Wiltshire, and since then it has been recorded with steadily increasing frequency throughout southern and eastern England , as far north as south-east Yorkshire . It has now been found in about 20 vice counties, including several records in Oxfordshire and Buckinghamshire, as well as Wiltshire. However the 2009 Radley record is the first for the vice-county of Berkshire (VC 22, in which Radley is located). The larvae feed on alders, including Alnus glutinosa and Alnus incana . When fully grown, they are about 50mm long and have a dark dorsal stripe all the way along the body. They generally feed between July and September, but may still be found as late as October. 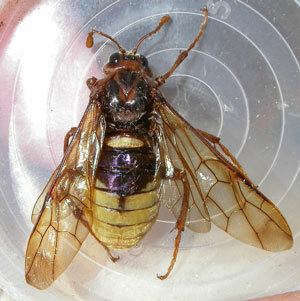 The imago (adult) is large (the Radley specimen measured 23mm in length and had a wingspan of 50mm) with a superficial resemblance to a hornet, though without the narrow waist and, of course, the fearsome sting. There are two other British Cimbex species, both of which are also rare. Cimbex femoratus the ‘birch sawfly’ has previously been the most frequent. Adults are black or red-girdled and the larvae are exclusively associated with birch. The other, Cimbex luteus remains extremely rare in Britain , although there have been a few recent records. The adult looks very much like Cimbex connatus , with which it can be mistaken, but is has more extensive yellow markings (which include the first few tergites and underside of the abdomen). It is associated with willows. Full-grown larvae of (left to right) Cimbex femoratus (Yorkshire), Cimbex connatus(Cambridgeshire) and Cimbex luteus (Cambridgeshire), September 2007. Many of the recent records of Cimbex connatus seem to be associated with amenity-planted Italian Alder in such exotic places as supermarket car parks. It may therefore be the case that at least some of the modern records are the direct or indirect result of accidental re-introductions. Although very rare, neither Cimbex connatus nor Cimbex luteus has any conservation status in Britain . Sawflies as a group, are regarded by horticulturalists as pests because of the damage their larvae can, and do, inflict on plants. However Cimbex spp feed on the leaves of specific species of trees, which are generally able to tolerate the damage, while the extreme rarity of the genus means that it does not pose any sort of significant widespread threat. On the other hand, they are spectacular and impressive insects as any one may be privileged to encounter in the wild. Sawflies are insects belonging to the suborder Symphyta, one of only two suborders in the order Hymenoptera (which is the same order as that to which bees, wasps and ants belong.) Like other Hymenoptera (but unlike true flies) the adults have two pairs of membranous wings (the word hymenoptera literally means ‘membranous wings’) but lack any obvious narrow waist between thorax and abdomen, a distinguishing characteristic of Hymenoptera in the other suborder, Apocrita. Sawflies get their name from the female’s saw-like ovipositor, which is used to cut or drill into the host plant. The eggs are usually laid in the plant tissue. The larvae typically resemble lepidoptera caterpillars and feed on soft plant tissue. The adults generally feed on pollen and nectar, though some are carnivorous. There are over 400 species of sawfly in Britain , and many are regarded as pests because of the quite severe damage that large larval populations can inflict on individual plants. The genus Cimbex belongs to the sawfly family Cimbicidae, which are also known as ‘club-horned sawflies’ because of their club-shaped antennae. The larval foodplants of Cimbex spp are trees, willow, alder and birch being specific to each of the three British species, C. luteus, C. connatus and C. femoratus respectively.